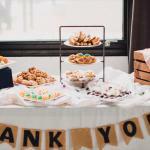 Let’s do brunch: A breakfast burrito bar, a family-made dessert spread, and plenty of DIY touches made this afternoon wedding one of a kind. 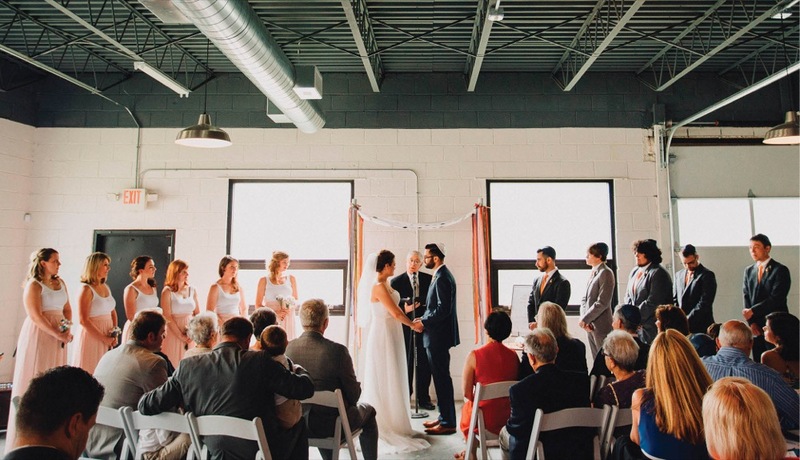 Slack and Wagreich married on July 6, 2014, in Pallet23, an urban warehouse-like space in Northside. 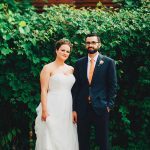 Bethany Slack and Peter Wagreich didn’t want a wedding that looked like everyone else’s, so setting the ceremony for noon on a Sunday and following it with a brunch reception was a great place to start. “We didn’t want a dance party,” says Peter, whose Jewish heritage was also a factor in choosing a non-Sabbath wedding day. 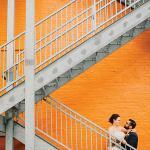 Pallet23, an urban warehouse-like space in Northside, was the perfect venue to make that vision a reality for their 85-guest wedding. Using a palette of navy blues, peaches, mints, and lavenders, they aimed for a vibe that was bright, airy, and modern. 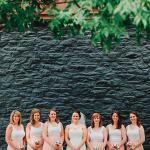 Bridesmaids wore long, peach-hued Joanna August skirts and white tank tops from Old Navy (budget win!). 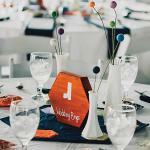 Bright white reception tables were topped with navy blue napkins and handmade center placemats. 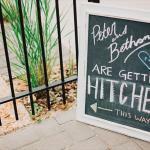 Instead of table numbers, the couple used wooden blocks—cut and stained by Peter and Bethany’s dad—that were painted with meaningful symbols of the International Phonetic Alphabet, a nod to their shared profession as speech therapists. In lieu of flowers were charming felt wool balls attached to floral wire, handcrafted by Bethany and her mom, which were used as centerpieces, boutonnieres, and bouquets. Forgoing the flowers wasn’t just a cost-cutter; it also provided a long-lasting memento of the day. “I loved the idea of having a bouquet that I could keep,” Bethany says. 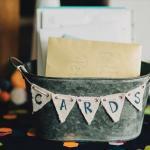 Also, there was no shortage of hexagons: on the DIY invitations, on the custom-made chuppah, as the seating cards, as table placemats, as table blocks, and on the favors. “For no other reason than I like making them and they fit well,” Bethany laughs. 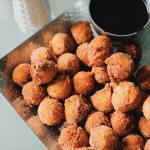 Guests enjoyed doughnut holes and a make-your-own breakfast burrito bar. Serving their guests a fun and delicious meal was a high priority, and Eat Well Celebrations and Feasts didn’t disappoint. 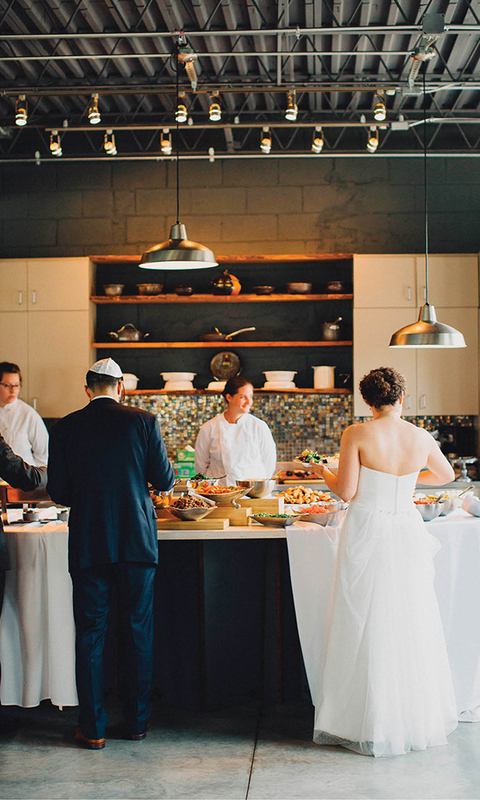 A sweet-and-salty combo of doughnut holes and bagels and lox were featured as appetizers, and guests adored the make-your-own breakfast burrito bar. Peter home-brewed four beers for the occasion, including a kolsch, a saison, and a pale ale. 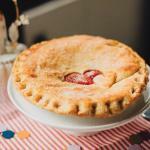 To end on a personal note, the couple asked friends and family to contribute baked specialties to a mega dessert bar. 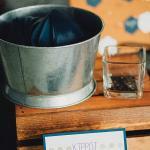 From baklava to brownie cups to “monster” cookies, the spread was sweet and sentimental—like the wedding itself. 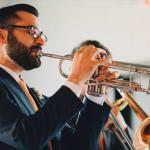 The couple replaced table numbers with meaningful symbols of the International Phonetic Alphabet, a nod to their shared profession as speech therapists. 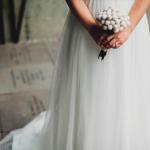 The bride had a bouquet of felt wool balls. 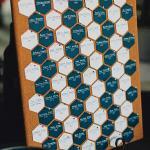 The couple used hexagons for many details, including the seating cards. 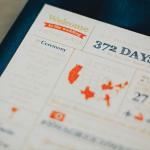 Bethany and Peter created a bright, modern celebration full of personalized details. Originally published in Cincinnati Wedding Magazine Summer 2015.